Beaver Scouts are the youngest members of The Scouting Family usually aged between 6 and 8 years old, although a young person can join in the three months leading up to their 6th birthday and stay until they are 8½. We now have two separate Beaver groups. Our Beaver Scouts meet from 6:00pm-7:00pm on Mondays and Thursdays. What’s the best thing about Beaver Scouts? Activities, trips and making friends are all part of what makes it so much fun for girls and boys. As well as earning activity badges, many Beavers Scouts get to go on camps and sleepovers, often for the first time. For more information please pop in on a Thursday evening for a chat with a member of our friendly and helpful leadership team, or simply complete the contact form below. 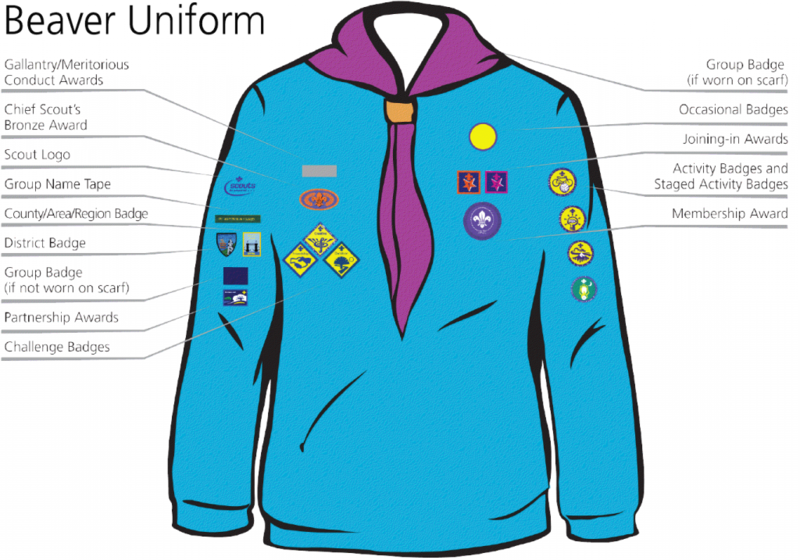 For details of the badges available for Beaver Scouts to earn and their requirements, please follow this link: Beaver Scout Badges. For anyone unsure of which badges should be sewn where, please see the image below.